The MNI Chicago Business Barometer fell 4.5 points to 57.4 in March, down from 61.9 in February, hitting the lowest level in exactly one year. Firms’ operations continued to expand in March, but the pace of expansion moderated for a third straight month. Three of the five Barometer components receded on the month, with only Employment and Supplier Deliveries expanding. “The Chicago Business Barometer calendar quarter average had increased for six straight quarters until Q1 2018, with the halt largely due to the recent downward trajectory of orders and output,” said Jamie Satchi, Economist at MNI Indicators. “Troubles higher up in firms’ supply chains are restraining their productive capacity and higher prices are being passed on to consumers. On a more positive note, firms remain keen to expand their workforce,” he added. This was well below the consensus forecast of 63.2, but still a decent reading. Reis released their Q1 2018 Office Vacancy survey this morning. Reis reported that the office vacancy rate increased to 16.5% in Q1, from 16.4% in Q4 2017. This is up from 16.3% in Q1 2017, and down from the cycle peak of 17.6%. Defying a healthy job market, the office vacancy rate increased in the first quarter to 16.5%, up from 16.4% at year-end 2017 and 16.3% in the first quarter of 2017. The vacancy rate has increased 30 basis points from a low of 16.2% in Q4 2016. The national average asking rent increased 0.8% in the first quarter while effective rents, which net out landlord concessions, increased 0.9%. At $32.87 and $26.67 per square foot, respectively, the average market and effective rents have both increased 2.2% from the first quarter of 2017. Net absorption was 6.2 million square feet, which was above the average quarterly absorption level of 2017: 5.9 million square feet. Construction was also higher than average: 10.9 million square feet, above 10.6 million square feet per quarter in 2017. Moreover, the first quarter tends to see the lowest activity; thus, this was a relatively strong quarter given the Nor’easters that plagued the Northeast. Moreover, the market seemed to have stagnated in 2017 as companies had put off making office leasing decisions until a fiscal stimulus was passed. The passing of the Tax Reform and Jobs Act should deliver higher profits and stronger business confidence which should spur stronger office leasing this year. Reis reported the vacancy rate was at 16.5% in Q1. The office vacancy rate has been mostly moving sideways at an elevated level, but has increased a little recently. Personal income increased $67.3 billion (0.4 percent) in February according to estimates released today by the Bureau of Economic Analysis. Disposable personal income (DPI) increased $53.9 billion (0.4 percent) and personal consumption expenditures (PCE) increased $27.7 billion (0.2 percent). Real DPI increased 0.2 percent in February and Real PCE increased less than 0.1 percent. The PCE price index increased 0.2 percent. Excluding food and energy, the PCE price index increased 0.2 percent. The February PCE price index increased 1.8 percent year-over-year (up from 1.7 percent YoY in January) and the February PCE price index, excluding food and energy, increased 1.6 percent year-over-year (up from 1.5 percent YoY in January). The following graph shows real Personal Consumption Expenditures (PCE) through February 2018 (2009 dollars). Note that the y-axis doesn't start at zero to better show the change. Using the two-month method to estimate Q4 PCE growth, PCE was increasing at a 1.4% annual rate in Q1 2018. (using the mid-month method, PCE was increasing 0.4%). This suggests weak PCE growth in Q1. Real gross domestic product (GDP) increased at an annual rate of 2.9 percent in the fourth quarter of 2017, according to the "third" estimate released by the Bureau of Economic Analysis. In the third quarter, real GDP increased 3.2 percent. The GDP estimate released today is based on more complete source data than were available for the "second" estimate issued last month. In the second estimate, the increase in real GDP was 2.5 percent. With this third estimate for the fourth quarter, the general picture of economic growth remains the same; personal consumption expenditures (PCE) and private inventory investment were revised up. Here is a Comparison of Third and Second Estimates. PCE growth was up to 4.0% from 3.8%. Residential investment was revised down from 13.0% to 2.8%. This was above the consensus forecast. Mortgage applications increased 4.8 percent from one week earlier, according to data from the Mortgage Bankers Association’s (MBA) Weekly Mortgage Applications Survey for the week ending March 23, 2018. The average contract interest rate for 30-year fixed-rate mortgages with conforming loan balances ($453,100 or less) increased to 4.69 percent from 4.68 percent, with points decreasing to 0.43 from 0.46 (including the origination fee) for 80 percent loan-to-value ratio (LTV) loans. Freddie Mac reported that the Single-Family serious delinquency rate in February was 1.06%, down from 1.07% in January. Freddie's rate is up from 0.98% in February 2017. Mortgage rates moved sideways to slightly higher today, keeping them in an exceptionally narrow range that's persisted for the entire month of March. As of last Thursday, rates looked like they might make an attempt to challenge the lower boundary of that range, but they quickly backed off (or backed "up" as the case may be). Friday and today have seen a fairly steady move back toward the middle of March's range. 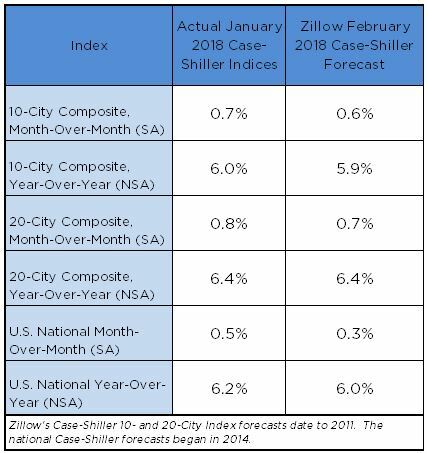 • At 9:00 AM ET, S&P/Case-Shiller House Price Index for January. The consensus is for a 6.2% year-over-year increase in the Comp 20 index for January. • At 10:00 AM, Richmond Fed Survey of Manufacturing Activity for March. This is the last of the regional surveys for March. Chicago Fed "Index points to a pickup in economic growth in February"
Off-topic: "March, Vote, Change the World!" To find a local march, here is the March for Our Lives website. Make a difference today! Beginning with Columbine in 1999, more than 187,000 students attending at least 193 primary or secondary schools have experienced a shooting on campus during school hours, according to a year-long Washington Post analysis. This means that the number of children who have been shaken by gunfire in the places they go to learn exceeds the population of Eugene, Ore., or Fort Lauderdale, Fla.
March. Vote. Change the World. At this point, the S&P500 is up 16.4% under Mr. Trump - compared to up 44.8% under Mr. Obama for the same number of market days. The graph below shows the year-over-year change for non-contingent inventory in Las Vegas, Phoenix and Sacramento, and also total existing home inventory as reported by the NAR (all through February 2018). Note that inventory is Sacramento was up 17% year-over-year in February (still very low), and has increased year-over-year for five consecutive months. However inventory is down Nationally, and down in Phoenix and Las Vegas. In the week ending March 17, the advance figure for seasonally adjusted initial claims was 229,000, an increase of 3,000 from the previous week's unrevised level of 226,000. The 4-week moving average was 223,750, an increase of 2,250 from the previous week's unrevised average of 221,500. The dashed line on the graph is the current 4-week average. The four-week average of weekly unemployment claims increased to 223,750. Earlier: NAR: "Existing-Home Sales Rebound 3.0 Percent in February"
1) As usual, housing economist Tom Lawler's forecast was closer to the NAR report than the consensus (although only slightly closer this month). See: Lawler: Early Read on Existing Home Sales in January. 2) Inventory is still very low and falling year-over-year (down 8.1% year-over-year in February). More inventory would probably mean smaller price increases, and less inventory somewhat larger price increases. This was the 33rd consecutive month with a year-over-year decline in inventory. Sales NSA in February (319,000, red column) were above sales in February 2017 (315,000, NSA). Sales NSA are always low in January and February, and we will have to wait until March - at the earliest - to draw any conclusions about the impact of higher interest rates and the new tax law on home sales.